While I’m a fan of blockbuster, roller coaster ride science-fiction, such as “Star Wars,” I can also appreciate more intimate, cerebral films, like “2001: A Space Odyssey.” The first half of “District 9” treads in the latter territory, but the second half veers toward the former and stays there. I was left wishing that some of the themes touched on in the first half had been developed in more depth during the run-up to the climax, but I didn’t feel the film was completely derailed: there’s enough of interest in acts one and two to merit a screening or two. 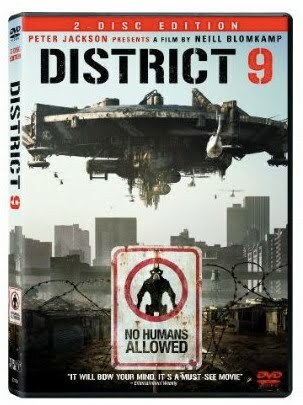 “District 9” opens with a documentary piece that sets a unique stage: during the mid-1980s, a spaceship appeared over Johannesburg, South Africa and hovered there for months, with no sign of activity, before representatives of a company called MNU cut their way in. They found thousands of aliens who appeared to be low-level worker drones; their leaders seemed to be gone. The creatures soon found themselves dumped in a slum called District 9; the apartheid parallels are made obvious. Fast-forward to today. Our protagonist, Wikus Van de Merwe, is an MNU bureaucrat who has been promoted to a new position tasked with overseeing the forced move of the aliens into a new slum called District 10. While doing his job, clipboard in hand and MNU regulations always on the tip of his tongue, Wikus accidentally sprays himself with an alien goo that begins transforming him into one of them. When his bosses, including his wife’s father, learn that he can fire the aliens’ weapons, which humans have never been able to use, they decide he can best serve MNU by being killed and dissected for his DNA. Wikus escapes, of course, and that’s where “District 9” becomes a more conventional science-fiction film, especially when he forms an uneasy alliance with an alien named Christopher, who apparently is smarter than the others and was stockpiling the goo to fuel the spaceship he wants to fly back to his home planet. Christopher wants to retrieve his goo from MNU’s bowels, and Wikus wants to figure out a way to stay alive and hopefully reverse the transformation. And while I appreciated the film’s non-U.S.-centric point-of-view, given how many in Hollywood seem to think no other country can ever be involved in anything of importance, I found it hard to believe that South Africa would be left to deal with the aliens by themselves. I’m sure the United States would ensure it was heavily invested in overseeing District 9 and keeping its finger on the pulse of the situation. However, that’s not as large of a quibble as my other points. The importance of setting the film in South Africa is covered, along with many other interesting subjects, in director Neill Blomkamp’s commentary track. He discusses growing up in Johannesburg and how he wanted to get the essence of the city across to viewers. He also gets into many of the technical aspects of making the film, which shouldn’t be a surprise given the fact that “District 9” is an expanded version of a short film that wowed many viewers on YouTube, including studio executives who were impressed by his ability to put together something so professional on such a limited budget. Disc one also includes a little over 20 minutes worth of deleted scenes, none of which made me feel like the film would have been better off with them. At best, they elaborate on the backstory, and at worst, they simply supply inconsequential tangents from the main plot. Thirty-four minutes worth of featurettes, dubbed “The Alien Agenda: A Filmmaker’s Log,” cover the film’s inception, its shooting, and its final refinement. Blomkamp, producer Peter Jackson, and many others chime in with their thoughts, and copious amounts of behind-the-scenes footage serves to illuminate the discussion. Disc two offers up another 45 minutes-plus of featurettes, which is a nice supplement to what’s on disc one. Considering how many movies are released on DVD with basic, by-the-numbers supplements these days — I imagine that’s been caused by economic pressures and a desire to pack Blu-ray discs with exclusive bonus stuff — I appreciated Sony’s willingness to go the extra mile here. The featurettes cover the effects used to transform Wikus into an alien, the improvisational style Blomkamp encouraged on the set, the design and creation of the District 9 slum, and the special effects used to create the aliens, who were played by actors wearing motion-capture suits and replaced in the computer. It’s all good material — my only criticism here is that more could have been packed onto the disc, since a DVD can comfortably hold two to three hours of video. “District 9” may not quite live up to what I was hoping to get out of it, but it’s a solid effort that’s admirable for its willingness to take the risks it does. I’m looking forward to seeing what Blomkamp comes up with next. Posted in Film Reviews, Side Shots Film Blog and tagged DVD Reviews, Science Fiction. Bookmark the permalink. Trackbacks are closed, but you can post a comment.